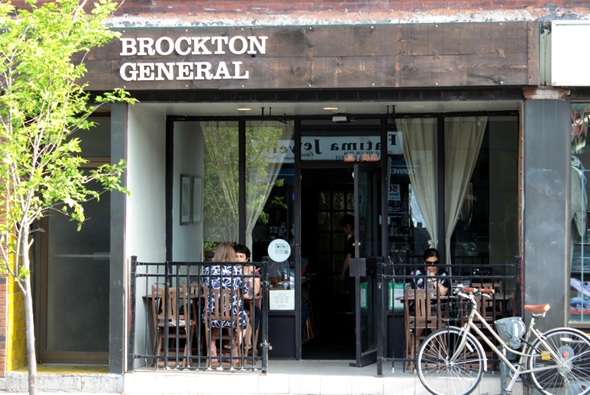 Brockton General is almost a year old now. Recognized as one of the best new restaurants to open in Toronto last year, it sprang from the ashes of Pablo, one of the ubiquitous Portuguese sports bars that dot this Dundas West neighborhood . 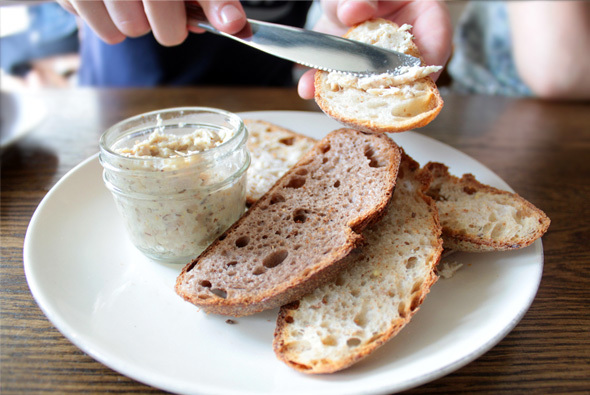 In its short-life, the restaurant has garnered a reputation for its bold menu which changes daily and since they've recently installed a new chef (Alexandra Feswick from Earth ) we decide to stop in to see how things were going. The mismatched china and chairs, accented by the roll of craft paper displaying the day's specials, plays into their flea market decor. A worn door doubles as a chalk board listing the assorted yummy Quebec and Ontario Cheeses ($16 a plate). 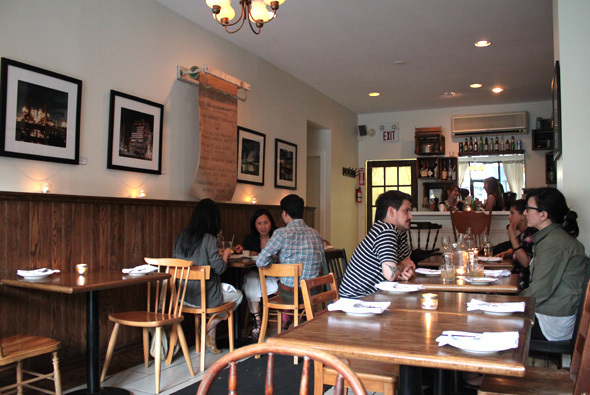 Nonchalant and humorous, the service is refreshingly cordial - more akin to a Sunday supper at an old friend's house. 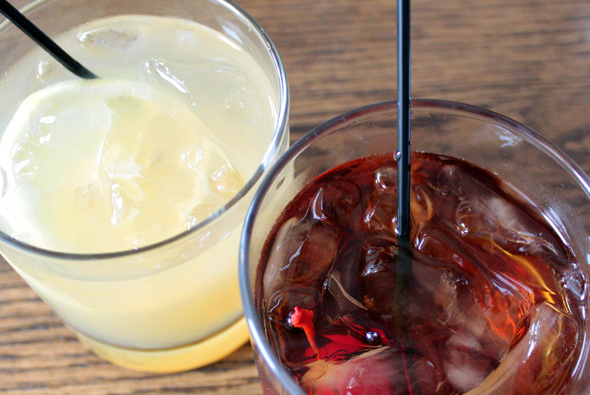 The mainly local wine list consists of VQA plonk, so we decide to go for the hard stuff and wet our whistle with their cocktails. Bourbonade ($9), with house made thyme syrup, is refreshing as is the Red-Headed Stepdaughter ($10) - their playful version of the Manhattan. The potted animal lacks enough schmaltz to be spreadable. The main problem being the consistency which resembles that of canned tuna. 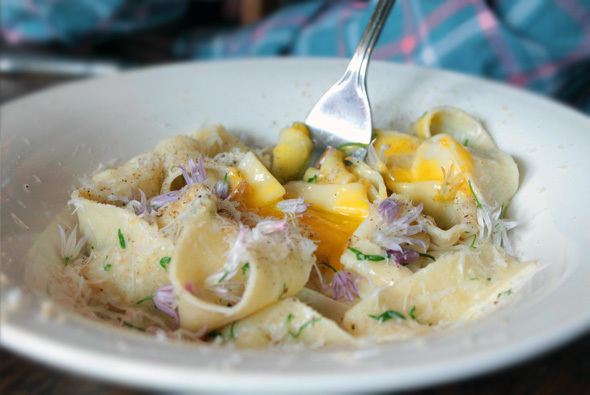 The house made Maltagliati ($16), Italian for 'badly cut' noodles, with egg yolk and Toscano cheese could best be described as a deconstructed Carbonara. The chive flowers are a lovely choice and lend a blast of flavour, but I miss the robustness of pancetta and black pepper often found in the classic. The seared duck breast with rhubarb compote and scallion pancakes ($20 - top photo) is the best dish of the evening -- the flavours of the duck and rhubarb complemented each other nicely. I only wish the duck was seared at a higher heat to develop a crackling crust. 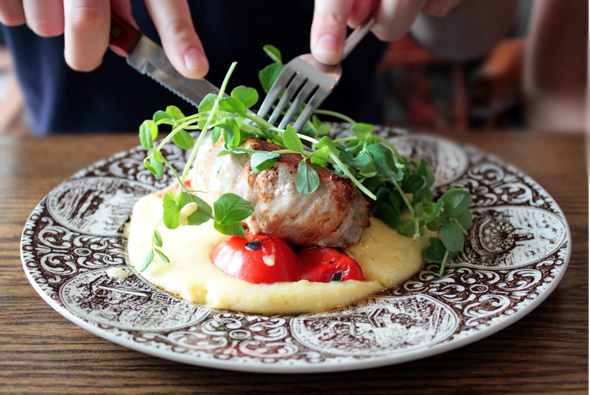 Another dish tried by our party is the seared pork loin with pea shoots over a plate of grits and grilled peppers ($18). The peppers are not properly scorched of their skins but the grits could've doubled as creamy polenta. Perhaps I'm reckless for liking my swine slightly pink but I found the loin overcooked and tough. 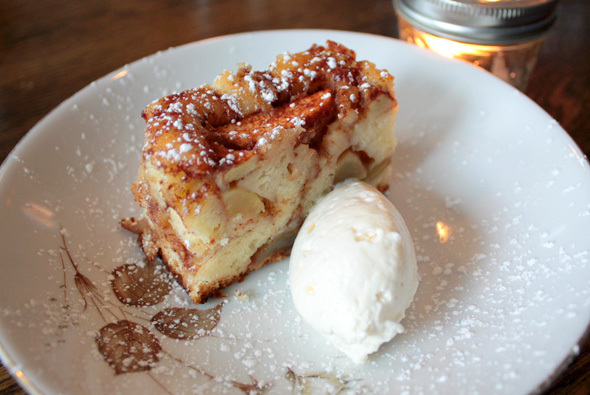 For dessert, the cinnamon apple cake with maple cream ($7) is a slice of home. Not overly sweet, the dessert reminds me of Autumn even on a thirty degree day. We want more. Most dishes explore subtle flavours but lack stamina to be memorable. There are a few missteps but that's to be expected for such a revolving menu. It's worth a shot for those feeling adventurous - just bring your wallet. Writing by Ryan Spencer. Photos by Peter Henderson.